Fill the form to confirm your registration. Khattu, better known as ‘Ganj Baksh’. The construction of the mosque was started in 1445 during the time of Mohammed Shah, the successor of Ahmed Shah who built the city of Ahmedabad. Some of the important buildings added in the complex by the subsequent heirs to the throne, especially Mahmud Begada, include the Jama mosque, the king’s and the queen’s mausoleum, a library, the Bara-daris, Fatehwadi and the Tomb of Khwajah Ghiasuddin. Overall, the complex is a fusion of Islamic and Hindu-Jain style and the aesthetic stone jalis playing light and shadow take all the attention. This entire cluster of monuments overlooks an amazingly large water tank—the Ahmed Sar—and its ‘Ghat-styled’ steps interrupted by elegant seating, lead to the tank waters. The breathtaking view of the ruins of the king and queen’s palaces with their open pavilions seen across the tank appear frozen in time. 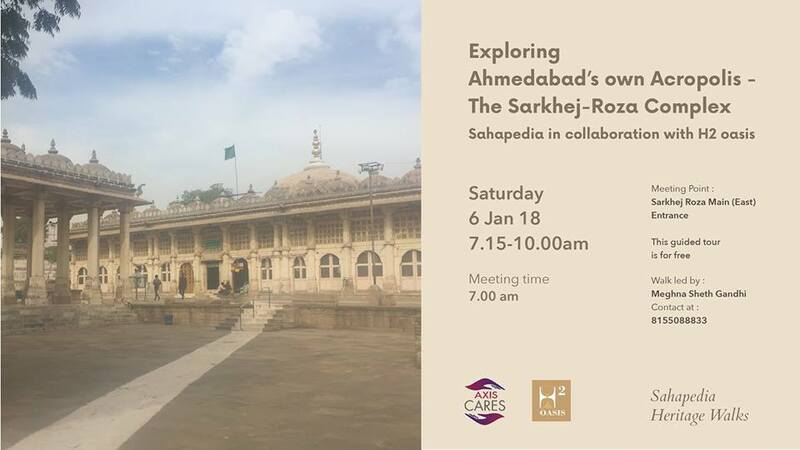 This walk intends to take the participants around the splendid architecture that was once called ‘Acropolis of Ahmedabad’ by the legendary French Architect Le Corbusier. Meeting Point: Sarkhej Roza’s Main (East) Entrance. Walk Leader: Meghna Sheth Gandhi, founder of H2 oasis—the History &amp; Heritage Oasis.  Mandatory registration closes after 25 entries. If you are unable to attend the walk after having registered, please inform us over an email or a text message. knee-length; women must carry a head scarf/ dupatta.  Ideally wear walking shoes (and socks) and carry water.  Ample parking available near the entrance.